SoCal Fireplace Mantels is your premiere source for quality imported natural stone fireplace surrounds. We offer over 67 models of natural stone fireplace mantels and seven overmantels to choose from. As your leading provider of stone fireplace mantels in Los Angeles, we are pleased to provide you with one of the largest selections of stone. Whether you prefer the clean, crisp look of imported white marble, the dramatic look of white and maroon marble, the timeless look of grey granite, or even the classic look of white or colored limestone, we have the type of stone that is ideal for your needs. In addition to offering one of the area’s largest selections of stone for your fireplace surround, we are the leading Los Angeles stone fireplace mantels provider for design options. Whether you desire a natural look featuring carved leaves and flowing lines, if you prefer a classic antique look with plenty or ornamentation, or if you desire a clean, modern look for your fireplace mantel or overmantel, we have what you desire. As your Los Angeles stone fireplace mantels provider, we know that not everyone calls us or enters our showroom with a specific option in mind. If you have a newly installed fireplace and you need comprehensive help with choosing the right natural stone mantel or overmantel, we can help. We have a skilled staff of design consultants who are well versed in all of our natural stone products and who can expertly guide you as you consider your options. SoCal Fireplace Mantels is a provider of stone fireplace mantels in Los Angeles. We also serve Orange County, Ventura County, and the surrounding areas. 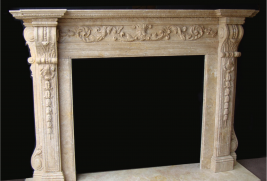 Call today to request a catalog of our quality fireplace mantels and overmantels and quality architectural statues and other precast products, or visit our extensive showroom in Van Nuys to view our products for yourself. Our knowledgeable design consultants will be pleased to answer any questions that you may have as well as help you choose the right fireplace surround for your needs.